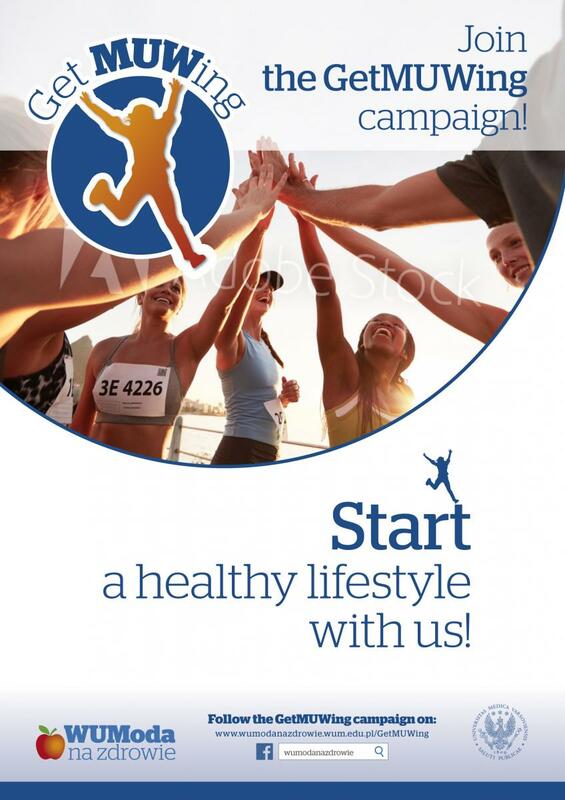 The Medical University of Warsaw has launched a GetMUWing campaign to promote healthy living among students, faculty and staff. The GetMUWing campaign is intended to inspire, motivate and support international students to begin or maintain a healthy lifestyle. All international students are invited to participate in the GetMUWing campaign activities. 1. GetMUWing by taking “simple steps for caring about me”. To live healthy, one has to start with “me”. Activities organized in this category will focus on ways to prevent health problems. We have asked experts to address this topic. 2. GetMUWing by making “healthy eating - a good habit”. Activities organized in this category will focus on ways to help you develop a healthy diet. Specialist, dieticians and students will be giving advice on healthy, nutritious eating and its benefits during information sessions, workshops and events. 3. “GetMUWing and feel better!”. Physical activity can help both your mental and physical wellbeing. We want to showcase ways you can move more if you are sitting in front of a computer, training indoors or prefer the outdoors. GetMUWing and join our events! Count your steps – you are invited to record your steps using free mobile apps. There will be prizes for the most active walkers. Walking is healthy. Make walking a habit. Mobilized – you are encouraged to use the staircase and not the lift. Choose more demanding ways to travel over convenience and comfort. It may be your only physical activity in a day! Served up on a plate – attend workshops led by students from the Life Style Medicine Club and learn about the whole-food, plant-based diet and recipes. Good, morning fruit – pick up a fruit at the door and start your day at the Medical University of Warsaw with a fruit snack. Bon Appetit! Come play sport at our University’s state-of-the-art facilities! Come run and discover our beautiful surroundings! Come play any of five sports: football, volleyball, basketball, badminton or a selection of athletic sports at the Sports and Rehabilitation Center. Games begin at 16:00 on Wednesdays and 15:30 on Fridays and last 90 minutes (part of optional courses program for students). Team up and play football! Tournaments every last Wednesday of the month at the Sports and Rehabilitation Center. Go for a run at Mokotów Park! Enjoy an active afternoon every Wednesday in the beautiful Mokotów Park located across the street from our University. Running groups to form after sport in the Sports and Rehabilitation Center. Take the Cooper test! The Cooper test is a test of physical fitness. It was designed by Kenneth H. Cooper in 1968 for US military use and is used to monitor the development of the athlete's aerobic endurance and to obtain an estimate of their VO2 max. SOURCE: https://www.brianmac.co.uk/gentest.htm. The point of the test is to run as far as possible within 12 minutes. To take the Cooper test come to the Skra Stadium, ul. Wawelska where we will be recording your results. There will be rewards from the Dean for three students with the best results. Leading the GetMUWing campaign sports activities is PE trainer Jerzy Rudzik of the School of Physical Education and Sport of the Medical University of Warsaw.